This gouache painting was done on just such a day as today about eighteen years ago. The relentless grey of early March was just beginning to give way to hints of color in budding trees. 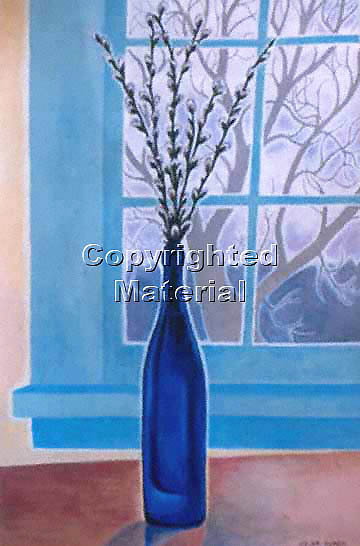 Seeking an interesting foreground to evoke the landscape outside my window, I found this shapely blue bottle, and stuck some pussywillows (from the previous year) in it. As always, I was intrigued by the polarity between near and far, inside and outside, manmade and natural. It was one of those times when I was “stealing” several hours from my other work in order to paint something for my own satisfaction. Many of my fine art paintings are the result of similar acts of time theft. The punishment, as a working single parent, is usually several nights of burning midnight oil to make up for the lost time (tonight is another such night, as I write this post at 2am after “stealing” time to work on a painting earlier today for which I really had no time). Deadline pressure is the story of my life! Order Chestnut & Pussywillow as a POSTER this week, and get a free greeting card (of the same image)! $10 for the poster and card, shipping included. Order your poster here! Wishing you a good week, and may spring bring color soon! This entry was posted in Image of the Week. Bookmark the permalink.